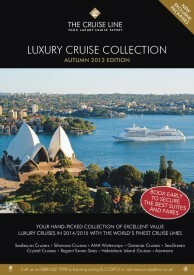 For the last 10-years we have pioneered our famed Luxury Cruise Collection. Using our own in-house cruise knowledge and working in partnership with some of the world’s leading cruise lines we have delivered a quarterly glossy brochure packed full of incredible offers and exciting itineraries. Our autumn collection is no different, however this time we have decided to launch online two weeks earlier than the print publication release, giving our online clients the opportunity to have an exclusive first sneak peek at what’s on offer. We have 71 exceptional offers from 9 luxury cruise lines including Regent Seven Seas, Oceania Cruises, Silversea, Seabourn, SeaDream Yacht Club, Crystal Cruises and Hebridean Island Cruises. Destinations include the Mediterranean, North and South America, Scandinavia, the Caribbean, and Baltic region as well as popular river cruise routes with AmaWaterways. Our latest brochure also comes with a selection of cruise packages that are exclusive to The Cruise Line, including our wonderful Cunard, Queen Mary 2 Independence Day 2014 no-fly option. You can enjoy a relaxing, westbound transatlantic crossing before reaching New York City where you shall spend 5-nights in a luxurious city hotel before being transferred back to the port for your eastbound sailing. Transfers and a selection of city tours are included in the price. “I am delighted to present our autumn edition of Luxury Cruise Collection, a hand-picked and expertly crafted selection of the very best luxury cruises and at the very best fares, many of which are now exclusive to us. Within this edition our focus is very much on cruises for 2014 as now really is the best time to secure the right suite or stateroom and at the best fare possible. As one of the very first luxury cruise specialists in the UK, all of our expert cruise advisers have personally travelled on most of the ships we offer within this collection, meaning we can assure you of the very best advice and knowledge when making your booking with us”. For more information on our Luxury Cruise Collection or for further details on any of the featured voyages, please call one of our Cruise Experts on 0800 008 6677.